Procedure For Grant Of Registration Certificate to Abattoirs /Meat Processing Plants. + Lifting of ban by Saudi Aribia on Import of live birds, hatching eggs and chicks from the approved companies. + Guideline for Export of Products of Animal Origin to Vietnam. Animal Products plays an important role in the socio- economic life of India. 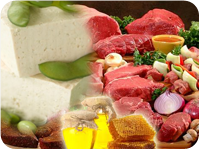 It is a rich source of high quality of animal products such as milk, meat and eggs. India has emerged as the largest producer of milk with 20.17 percent share in total milk production in the world. India accounts for about 5.65 percent of the global egg production and also the largest population of milch animals in the world, with 110 million buffaloes, 133 million goats and 63 million sheeps. Exports of animal products represent an important and significant contribution to the Indian Agriculture sector. The export of Animal Products includes Buffalo meat, Sheep/ Goat meat, Poultry products, Animal Casings, Milk and Milk products and Honey etc. India's exports of Animal Products was Rs. 29,813.69 Crores/ 4,623.05 USD Millions in 2017-18, which include the major products like Buffalo Meat (Rs. 26033.83 Crores/ 4036.89 USD Millions), Sheep/ Goat Meat (Rs. 835.75 Crores/ 129.68 Millions), Poultry Products (Rs. 552.16 Crores/ 85.71 USD Millions), Dairy Products (Rs. 1196.19 Crores/ 185.49 USD Millions), Animal Casing (Rs. 327.44 Crores/ 50.68 USD Millions), Processed Meat (Rs. 9.91 Crores/ 1.54 USD Millions), Albumin( Eggs & Milk (Rs. 83.72 Crores/ 12.98 USD Millions), and Natural Honey (Rs. 653.58 Crore/ 101.32 USD Millions). The demand for Indian buffalo meat in international market has sparked a sudden increase in the meat exports. Buffalo meat dominated the exports with a contribution of over 89.08% in total Animal Products export from India. The main markets for Indian buffalo meat and other animal products are Vietnam Social Republic, Malaysia, Egypt Arab Republic, Iraq and Saudi Arabia.